I was assigned to the FBI’s Ann Arbor, Michigan office for most of my career (referred to as a resident agency or RA in the Bureau) We were primarily responsible for investigating violations of federal law in five counties which had a total population of about a million people. Ann Arbor is also the home of the University of Michigan, one of the largest and most prestigious research institutions in the world. A good thing about working in a RA was there were a variety of cases – some were very unique. It was August 1998 when I got a call from Detective Kevin McNulty of the UM Department of Public Safety. McNulty and I had worked cases together before, and he told me that they had located a meteorite that had been stolen from the UM Museum of Natural History. McNulty explained that the 60 lb. meteorite, worth about $10,000, had been stolen from the fourth floor of the museum a few days before. The meteorite that was stolen from the museum was actually a fragment of a much larger meteor that created the crater in Diablo Canyon when it struck the earth about 50,000 years ago. It is estimated that the meteor weighed about 60,000 tons with a diameter of approximately 100 feet and traveling at 30,000 mph when it hit. Most of the meteor vaporized on impact, but pieces of it were strewn around the crater. The impact had the explosive power of a ten megaton bomb (1 megaton = 1 million tons of TNT). The crater is almost 600 feet deep and is about 3,900 feet across. No humans would have been around to witness the impact. It would be at least 10,000 years before any humans would be in the area. It was the Spanish explorers in the 16th Century who named the canyon Diablo. For reasons that have been lost, the Indians who descended from the earlier inhabitants considered the canyon cursed. In the early 1900s, Daniel Barringer, a mining engineer who had made millions from silver mining in Arizona, took an interest in the crater. 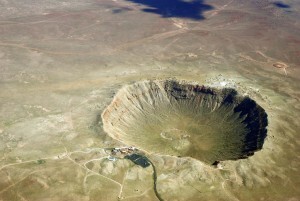 He believed that the crater had been caused by a meteor impact. The prevailing scientific theory at the time was that the crater resulted from some type of volcanic activity and the meteorite fragments around the crater were coincidental. Because fragments found in the area were composed of iron and nickel, Barringer believed the main mass of the meteor was buried beneath the floor of the crater and that meteor mass would be worth millions. Over the next several years, Barringer drilled numerous exploratory holes in the floor of the crater – some as deep as 1,400 feet. But he never hit any main mass nor did he discover an alien spacecraft. Barringer rightly deduced the crater was created by a meteor impact, but he didn’t understand the physics of the tremendous force caused by the impact which resulted in the near total vaporization of the meteor leaving only fragments. The Barringer family still owns the crater. It is a popular tourist attraction and has been designated a national historical site. Meanwhile back in Ann Arbor, there had been no witnesses to the theft of the meteorite, and at the time no surveillance cameras were in the area of the theft. After the theft, Det. McNulty had put a photo and description of the meteorite on the internet, a relatively new forum for broadcasting reports of stolen property. The rock dealer, Michael Casper, had been surfing the Internet and came across McNulty’s posting. Casper contacted the UM museum and confirmed the meteorite he had purchased was the one that had been stolen. McNulty wanted to recover the meteorite, but was concerned Casper, the dealer in NY, might not cooperate and McNulty had no police power in New York. I agreed to call Casper, and he was very cooperative. He understood that he was in possession of stolen property, and that because it had been transported interstate his continued possession of it was potentially a violation of federal law. He agreed to return it to UM. Casper also provided the name and address of the person who sold the meteorite to him, Steven Collins. Collins had called Casper and told him he had a 60lb. Diablo Canyon meteorite for sale. Casper initially agreed to purchase it for $2,300. When Collins delivered the meteorite, they agreed that Casper would pay $1,000 and trade a prehistoric crab fossil and a 200 lb. slab of crystallized purple quartz, amethyst, for the meteorite. Both McNulty and I assumed that the name and address that had been provided to Casper were false. But it turned out there was a Steven Collins living at the address given to Casper in Pittsfield Township, outside of Ann Arbor. That Steven Collins had been convicted of second-degree murder in Michigan; had served time and was currently on parole which could provide some leverage when dealing with Collins. McNulty made contact with Collins, and he readily admitted that he had sold the meteorite to the dealer in NY. Collins said he had run into a guy he had met in prison, and the guy had offered to sell him a meteorite that he said he had found in Arizona. He paid the guy a few hundred dollars knowing the meteorite was worth much more. Collins claimed he didn’t know the meteorite was stolen. Collins gave the name of the inmate, but no one by that name could be found in the Michigan Department of Corrections records. Although McNulty had recovered the meteorite, he didn’t have enough evidence to prosecute Collins for the theft from the museum. I thought we might be able to prosecute Collins federally for interstate transportation of stolen property (ITSP), but we needed for him to admit that he knew the meteorite was stolen. I believed Collins had stolen the meteorite himself, but I was pretty sure he wasn’t going to admit to that. However, sometimes a bad denial can be almost as good as a confession. I wanted to interview Collins again, and I wanted it to be a surprise. I didn’t want to give him time to prepare or worse decide he didn’t want to talk to me. I decided to try to talk to him where he worked. He was working for a construction company testing a cleared and graded site for the level of compaction of the soil – a good job for a self-described rock hound. I told Collins that we were having some trouble with his original story as there was no inmate by the name he gave us that had ever been in the Michigan prison system. In the bar he struck up a conversation with a guy about rocks. The guy seemed to be pretty knowledgeable, and he said he had a meteorite that he wanted to sell. They went to the guy’s car and in the trunk was a large meteorite that the guy said had come from Diablo Canyon. Collins knew that it was a meteorite, and had some idea of its value. He agreed to buy it for $400. He paid in cash and had no documentation of the sale. Collins claimed that he didn’t know the guy’s name, nor did have any contact information for him. Collins hadn’t seen him before or since. He hadn’t noticed whether the car’s license was from out-of-state. He was only able to give a very general description of the guy. Collins told me the name of the bar, but said he didn’t know any of the employees or patrons in the bar. 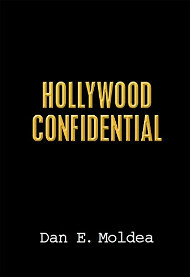 He didn’t think there was anyone in the bar who could corroborate any part of his story. Collins had not only changed his story when it was challenged, he had provided what I thought was a pretty weak new story as to how he acquired the meteorite – a bad denial. Collins was federally charged with Interstate Transportation of Stolen Property and his parole was violated for having left Michigan. He pleaded guilty and admitted to the judge he knew the meteorite was stolen when he transported it to NY. He was sentenced to nine months incarceration in addition to the about two years he did for parole violation. We never did learn how he was able to get the meteorite out of the museum without being seen. Posted: 9/16/15 at 10:06 AM under Uncategorized.